Faux holiday ribbon candy and plastic peppermints adorn a simple wooden frame painted with metallic color and stained glass paint. 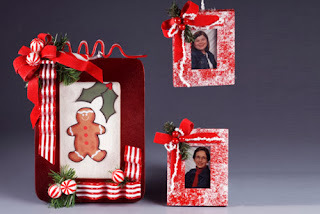 This craft is perfect to showcase any holiday photo or artwork. Remove picture backing and glass from frame. Sand frame smooth. Remove dust with a moist cloth. Following the instructions on the can and working in a well ventilated area spray frame with two coats of Gold. Allow the paint to dry between and after the second coat. Spray frame with a coat of Krylon® Stained Glass Red. Allow to dry. Glue ribbon candy to frame as shown. Form red velvet ribbon into a four loop bow securing the center with floral wire. Trim wire close to back of bow. Glue bow to upper left corner of frame. Glue short sprigs of evergreens around the bow and around the ribbon candy as desired. Glue peppermints to frame. Spray with a light coat of Gold Glitter Spray. Allow to dry. Insert picture, backing and glass into frame opening.